Love the bench, where is it from? hi there where is the dining table from? thanks! hello! where is the dining table from? Love it! Wall paint - What colour paint is used on the walls here please? Treat it like a sofaBenches and banquettes can be built-in or freestanding and the latter can boast all the same details as a sofa. So if you want more luxe banquette than park bench, look for a design with a padded back, thick seat cushions and arms, for maximum comfort. This bench has been designed to suit the long and narrow proportions of the room, providing ample seating without eating into floor space. Keep it calm and collected A south-facing conservatory will create the sunniest spot for mealtimes. These owners have made the most of that fact and fitted a comfortable bench that’s almost a sofa – designed for lingering. The low-hung pendant lights and hits of crimson ensure a warm vibe even on dull days. Dreamy decorating ideas for conservatoriesAlthough we may be in the midst of winter, Houzz users never stop dreaming of warmer days. The sun-drenched images in this ideabook are especially enticing on chilly afternoons.Houzzers coveted the laid-back furniture in these conservatories, and shared fantasies of lazy Sunday breakfasts enjoyed in these bright and airy spaces.Explore the conservatories TELL US…Which were your favourite ideabooks on Houzz UK, and why? Share your top picks in the Comments below. Slot in a lean-toA lean-to extension can be a great choice if you want your addition to be relatively slim and not cut too much into the garden. This one is a decent size, but smaller versions can work just as well. 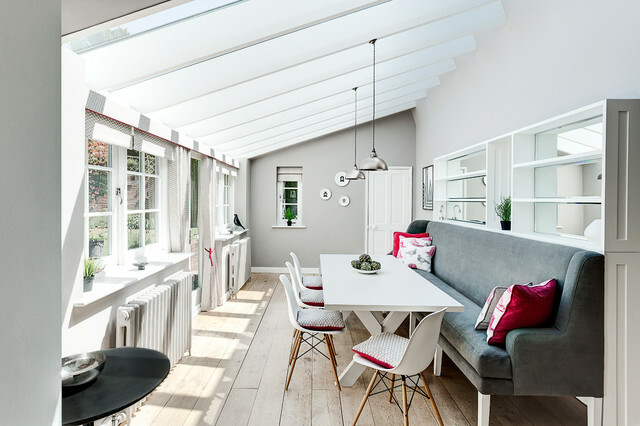 Lean-to structures also don’t compromise the view from upper rooms.The designers of this cottage extension have slotted in a roomy dining area thanks to a couple of space-smart tricks. The fitted banquette was designed especially to accommodate numerous people in a relatively narrow space. Mirrored shelving was then fitted above to reflect the garden and replicate windows that appear to open onto a separate room behind the sofa.